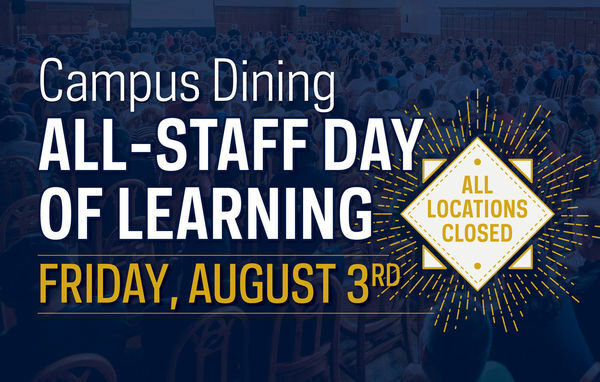 Campus Dining is engaging in its first annual all-staff Day of Learning on Friday, August 3, 2018. This is the least busy day of the year. All Campus Dining locations including Legends, University Catering, North and South Dining Halls, the Huddle, Duncan Student Center and all retail and express locations will be closed all day in order to allow the department to conduct a day of learning and training for Campus Dining staff. The on-campus day of training will be provided to nearly 700 regular staff and will become an annual activity for the department. Regular Campus Dining operations will resume on Saturday, August 4. Campus Dining will coordinate for multiple food trucks to be at Fieldhouse Mall near LaFortune Student Center from 11 a.m. to 1 p.m. in order to provide meal opportunities to our students, faculty & staff, and guests on campus. Additionally, Sorin’s and Rohr’s at the Morris Inn will remain open and welcome your business. Originally published by Cory Hankins at dining.nd.edu on July 25, 2018.